Dent Wizard was founded in 1983 by a group of business-savvy entrepreneurs. These sharp individuals have steered its growth into a successful international corporation with over 2,200 employees around the world. Our business is built around the core values of Excellence, Integrity, Innovation and Customer Devotion. Dent Wizard's winning combination for growth consists of embracing our humble, small business roots and the strong backing of our parent company, Gridiron Capital to build a reputation for unmatched stability and tremendous opportunity for our employees. Our employees come from a variety of backgrounds but all have one thing in common: the drive to succeed. We pride ourselves on being customer-driven and truly committed to providing exceptional service. We're committed to ensuring success and developing long term relationships with our customers as well as our valued employees. While the roots of our company lie in Paintless Dent Repair (PDR) technology and innovation, we have grown to become the leader in automotive reconditioning SMART repairs, offering automotive technician jobs in the areas of wheel repair, bumper repair and minor paint repair, interior repair, key programming, as well as our PDR and hail damage repairs. As our offerings have grown over the past three decades, the opportunities within Dent Wizard have continued to expand, providing our auto technicians with the experience to build upon their existing skills through frequent training and equipment innovation. Because we strive to provide our dealership customers with a true one-stop shop for their automotive reconditioning and vehicle repair needs, our auto technicians now have opportunities to be skilled in several vehicle repair types. 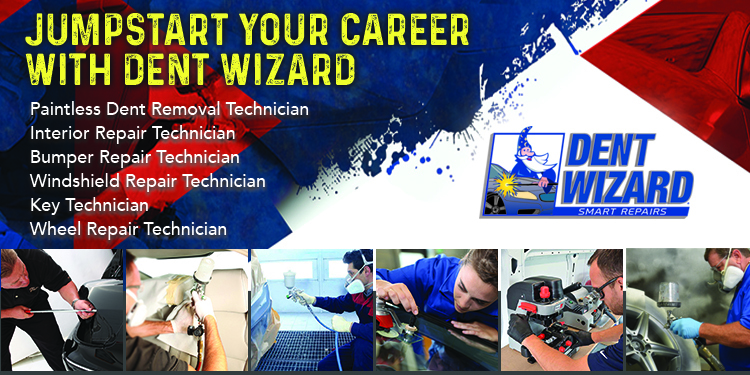 Entry level positions exist with Dent Wizard in any of the following positions. Providing our signature service, Dent Wizard offers the most comprehensive tuition-free PDR and automotive technician training program in the industry. PDR Technicians service new and existing customers by repairing ding and dent damage using Dent Wizard's propriety PDR process, providing excellent customer service, and educating prospective customers in regards to our service. Dent Wizard has become one of the largest automotive paint companies in the United States and Canada. Paint Techs typically have some background in paint or body repairs prior to working for Dent Wizard. We provide all the tools and equipment necessary to repair scuff, scrape and abrasion damage to bumpers and bumper covers and provide automotive technician training for new techs. Dent Wizard is also a leader in Wheel repair beginning with state of the art training and certification. Our auto technicians restore wheels and wheel covers with minor scrapes, scratches and scuffs to their original sheen. We are also pioneering methods of more advance wheel straightening and repair. Interior Technicians receive training to work with our major customers to provide interior repair including the repair of burns, minor tears and small punctures. Dent Wizard’s auto technicians restore upholstery to its original texture and appearance. Dent Wizard employs the largest number of automotive key technicians in the United States. Servicing our Auction customers, Dent Wizard provides state-of–the-art technology. Dent Wizard provides opportunities across the country for both sales-oriented and operations professionals who are self-motivated and have the right level of management and organizational skills. We are known for our dedication to supporting and building upon the existing skills and capabilities of outgoing and results-driven professionals.